Only you can reserve your natural rights. Your Living Jurisdiction is declared in your written and spoken words. 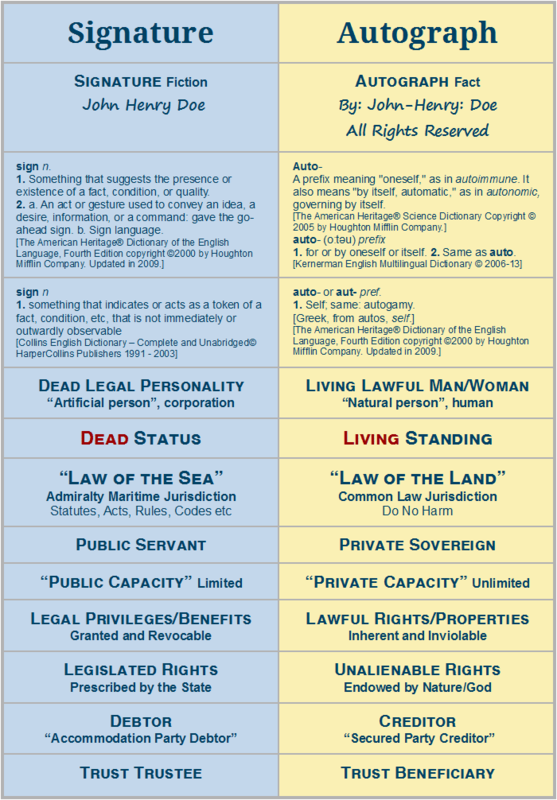 If you fail to declare your private Living Jurisdiction in the Common Law - the National Law of the Land, the public “legal person actors” will invariably make the “presumption” that you are “acting” as an “accommodation party” in “joinder” to a dead artificial legal “person” NAME, in the Admiralty Maritime Jurisdiction – the International Law of the Sea. The NAME can be described as a “person”, “legal person”, “legal personality”, “artificial person”, “legal fiction”, “ens legis”, “company”, “trade-name”, “vessel in commerce”, “transmitting utility”, “creature of the law”, “Ward of the State”, “employee of the State”, “public servant”, “Estate trust”, “Foreign Situs Trust”, “Cestui Que Vie Estate Trust”, “deceased Estate”, “decedent”, “corporation”, “corpse”, “franchise”, “bankrupt”, “surety”, “accommodation party”, “debtor”, or “debt ledger”. All legally generated fictions are debtors by default, because they are created without any inherent productive capacity. On any document, to avoid the presumption of “joinder” to one of those dead fictional things, it is at least necessary to use proper grammar, and ideally reserve all your rights. For example: By: John: of the family Doe. All Rights Reserved. On commercial paper, to avoid the presumption of “joinder” to one of those dead fictional things, bearing liability, it is necessary to separate yourself from the fictional entity by making an unambiguous declaration of your living standing as, for example, the “authorised agent”. This invokes the Common Law of Agency, in which the general rule is that the agent is not liable for the fictional entity/principal, if he/she makes it clear that he/she is the agent. For example: By: John: of the family Doe. 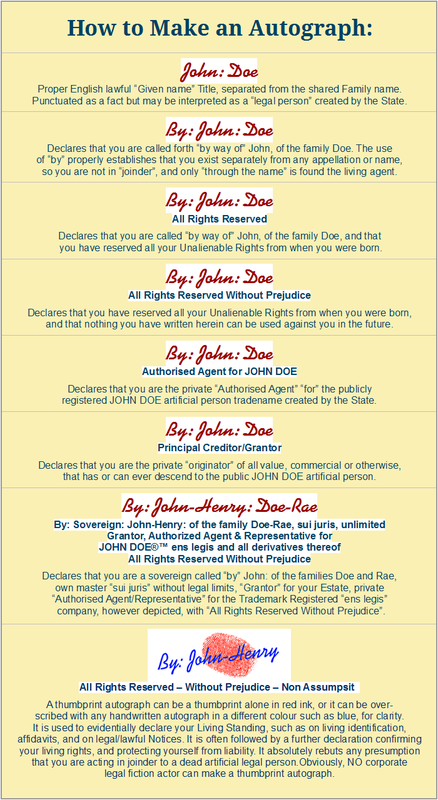 Authorised Agent for MR JOHN DOE. Importantly, a living man or woman is not evidenced by a “signature”. Section 3-401 of the Uniform Commercial Code (UCC), states that a signature can be made (i) manually or by means of a device or machine, and (ii) by the use of any name, including any trade or assumed name, or by any word, mark, or symbol executed or adopted by a “person”. Thus, it is any mark of a corporation. A “signature” is a “sign” that merely suggests the existence of something else not actually there – it is not evidence of substance and living capacity. Someone who makes a “signature” is an “accommodation party" in “joinder” to an artificial legal “person” NAME, with Dead Status, serving as surety for the corporate national debt in the Admiralty Maritime Jurisdiction – the International Law of the Sea. Whereas an “autograph” is a graphic from your living hand as a sentient, flesh and blood man or woman – it provides evidence of substance and living capacity, which is why a thumbprint is the ultimate “autograph” for a living man or woman. Someone who makes an “autograph” declares that they are a sovereign man or woman, with Living Standing, in the Common Law Jurisdiction – the National Law of the Land. Since you are born a sovereign in your own right without a master, you decide how best to make your autograph in any given situation. Autograph ink is red (life), blue (sea), or purple (royal). Black ink indicates debt and death. For handwritten autographs, the declaration of Living Standing is more important than the colour of the ink, however a thumbprint autograph is always in red ink denoting your lifeblood. The declaration of Living Standing beneath an autograph can be handwritten, typed, or rubber stamped, and can refer to the Universal Commercial Code (UCC). It is always best to reserve your rights in advance.